Last week we talked about an area of thermodynamics that concerns power cycles, an example of which can be found in a coal fired power plant. This week we’ll learn about another area of thermodynamics, that of refrigeration cycles. It’s been snowing in the Midwest, so the topic seems appropriate enough. A refrigeration cycle is obviously found in your refrigerator, but did you know that it’s also found in your air conditioner? Refrigeration cycles operate in Opposite Land as compared to power cycles. You know, the place where everything works in reverse. Instead of heat going into the cycle and electricity coming out, in a refrigeration cycle, electricity goes in and heat comes out—out of your refrigerator or air conditioned house, that is. Let’s consider an example of the simple air conditioner refrigeration cycle shown in Figure 1. 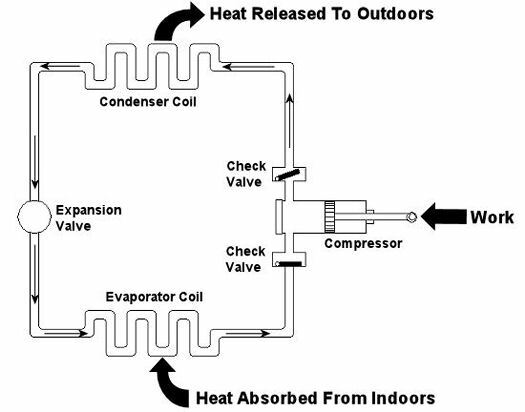 The cycle has four important parts: an evaporator coil, a compressor, a condenser coil, and an expansion valve. All parts are connected by pipes, and the entire system is sealed up tight with refrigerant inside. The compressor is the heart of the operation, so to speak. In our simple cycle, the compressor consists of an electric motor-driven piston that moves back and forth within a cylinder. The motor does work as the piston moves back and forth, and the compressor pumps refrigerant through the pipes, the condenser coil, the expansion valve, and the evaporator coil. Like your heart, the pump has check valves that keep refrigerant flowing through the system in one direction (counterclockwise in our example). Keeping the flow going in one direction is critical to the operation of the cycle, as we’ll see in a moment. The refrigerant is the life blood of the cycle. It is a chemical that is manufactured to have special thermodynamic properties. For example, it’s really good at quickly absorbing a lot of heat at low temperature, like the temperature of the air in your house. The evaporator coil in Figure 1 would be located on the inside of your home. As the refrigerant enters the evaporator coil, it is a mixture of liquid and vapor. Inside the evaporator coil, the liquid refrigerant boils off to a vapor as it absorbs heat from the room. Yes, that’s right, the refrigerant boils at room temperature! The heat absorption in the evaporator is helped along by using a fan to push room air across its coil. Warm air from the room gets sucked into the air conditioner and cool air blows out into the room. But that’s not the end of the story. That heat from the room has to somehow get outside of the house, where it can be disposed of. This is so the refrigerant can pick up another load of heat when it flows back through the evaporator coil. But disposing of the heat from the refrigerant isn’t easy, since heat naturally wants to flow from a hotter place to a cooler place. So how do you buck Mother Nature and get heat to flow from the inside of your house where it’s cool to the outside of your house where it’s hotter? It takes work, and that’s where the compressor comes into play. The compressor first pulls the refrigerant vapor out of the evaporator and raises its pressure and temperature. This heart, like our own, is a hard worker. As the vapor leaves the compressor and passes through the condenser coil located outside your home, it is in a state where it can easily give up its heat to the warm air outside. The release of heat is helped along by the use of another fan that serves to push the outdoor air across the outside surfaces of the condenser coil. Then, as heat is released to the outdoor air, the refrigerant condenses back into a liquid. After leaving the condenser coil, the liquid refrigerant passes through the expansion valve, where its pressure and temperature are reduced. The refrigerant is now ready to pick up a new load of heat in the evaporator coil, and the cycle repeats itself with the help of a working electric motor. Next week, we’ll continue our exploration of thermodynamics and narrow our focus onto an area known as stoichiometry, which is concerned with the math behind chemical reactions, like those that take place during the burning of fuels. Math is fun. Just keep repeating that to yourself. This entry was posted on Sunday, December 20th, 2009 at 8:45 pm	and is filed under Engineering and Science. You can follow any responses to this entry through the RSS 2.0 feed. Both comments and pings are currently closed.